Linda Coffey really can’t put her finger on why her Hamilton Elks squad has become THE standard for Division I Spring Team competition. 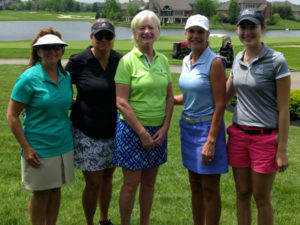 Hamilton Elks has reached a level not approached in the Greater Cincinnati Women’s Golf Association since Kenwood Country Club won seven straight Spring Team Division I championships from 1987 through 1993. Hamilton Elks never finished lower than third out of six teams and logged two first-place finishes to hold off Miami View and capture by a 10-point margin its seventh division championship in the last nine seasons. While Division I saw familiar faces holding the trophy, Divisions II and III experienced turnover. Western Hills, led by newcomer Allison Mayborg, captured the Division II title for the first time in what Laurie Brunsman said was her “five or six years” as team captain. Meanwhile, Summit Hills – already celebrating hosting the Women’s Metropolitan this year for the first time since 2006 – used depth to capture the Division III championship, its first since winning the 2011 Division III title, according to team captain Terri Roeding. 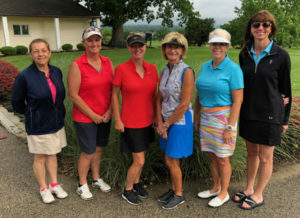 Coffey’s team of eight – including Brandi Duckwall, Julie Sizemore, Toni Soule, Jody Rusche, Stacey Hinckle, Vicki Felver and Sandy Roark – never trailed in the standings after piling up 35.5 points at Bel-Wood in the third of five rounds to take an 11.5-point lead over Terrace Park. The final margin over Miami View was short of 2017’s 31-point bulge, but it was decisive. “We usually start at the top of the handicaps of the Elks people and start down the roster and see who’s available,” Coffey said. “We love competition. Mayborg, a district champion and three-time state qualifier at Ursuline Academy who also played at the University of Cincinnati, bolstered a Western Hills team that finished third in Division II last spring. Western Hills built a 10-point lead over Camargo through the third of the division’s five rounds, but teams in the division must take a bye to when it’s their turn to host and Camargo was able to grab a 20-point lead over idle Western Hills. Western Hills returned the favor in the last week, sailing past idle Camargo to capture the championship by 10.5 points. Home course advantage played a key role in Summit Hills’s rise to the top. Four Bridges led by two points after the first of three rounds, Summit Hills piled up a whopping 39.5 points in Week Two at home before clinching the title with a narrow second-place behind Oasis in Week Three. Becky Wesdorp and Lisa Witzgall were two of several players who stepped up to fill lineup holes in the first two weeks of the short season, Roeding said. Amy Pugliano, Shelli Bitter, Jenny Brallier, Cheri Myers and Sue Averdick joined Roeding on the team that closed the deal on a 16.5-point margin – the widest of the three divisions. Fall Team play for 24 teams in four divisions is scheduled to start on September 6.